Up to 20 dBA depending on size of pump. Including group 2, 3 and multiple pumps and the latest released group 4 range. ELIKA®, Marzocchi's low noise, low pulsation hydraulic helical gear pump is a perfect fit for all applications that require low noise levels. 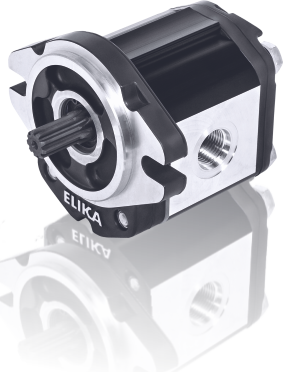 The ELIKA® gear pump reduces the noise level by an average of 15 dBA compared with a conventional external gear pump. 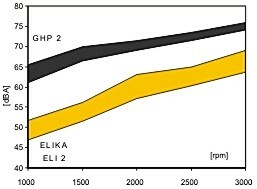 Pump Noise comparison [dBA] Marzocchi GHP2 to ELIKA ELI 2, same displacement 17.8 cm3/rev. ELIKA® is a patented product. The group II ELI2 is the first in the series of ELIKA range and includes hydraulic gear pumps with displacement from 7 to 35 cm3/rev; perfectly interchangeable with the standard gear pumps ALP2 and GHP2 series. The maximum operating pressures are similar to those of GHP2 series and extend up to 300 bar. 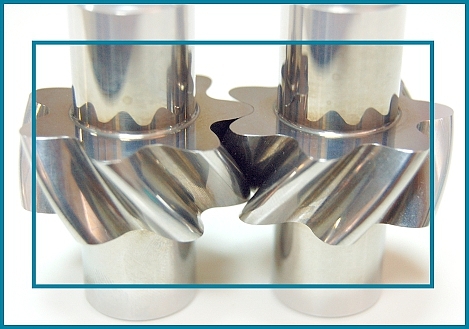 The helical gear ensures the continuity of the motion despite the low number of teeth. Specific compensation areas into flange and cover, insulated by special gaskets reinforced with anti-extrusion, allow for fully free axial and radial movement of the bushings, which is proportional to pump operating pressure. In this way, internal leakage is dramatically reduced, ensuring very good volumetric and mechanical pump performances, as well as proper lubrication of pump’s moving parts. 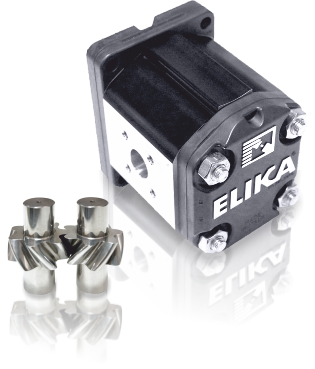 ELIKA® pumps are available in both uni-directional clockwise or counter clockwise rotation. ELI3 is the group III range in the ELIKA® series and includes pumps with displacement from 20.4 to 87.1 cm³/ rev; perfectly interchangeable with the standard gear pumps ALP3 and GHP3 series. The maximum operating pressures are similar to those of GHP3 series and extend up to 300 bar. 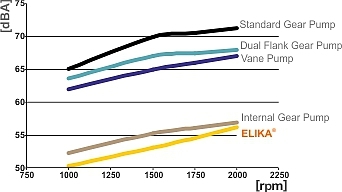 ELI4 is the group IV range in the ELIKA® series and includes pumps with displacement from 86.5 to 199.8 cm³/ rev; perfectly interchangeable with the standard gear pumps ALP4 and GHP4 series. The maximum operating pressures are similar to those of GHP4 series and extend up to 270 bar. External gear pumps are the most popular pumps used in modern hydraulic systems. These external gear pumps feature versatility, strength and long useful life. View the wide range of » high quality hydraulic pumps and motors to suit a wide range of applications. *Link for further information about the new helical gear fluid transfer pumps; FTP low noise, high efficiency helical gear pump.